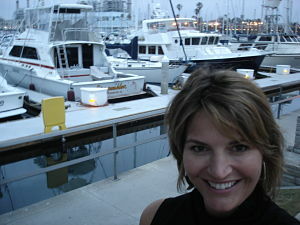 Masterminding in Redondo Beach, CA. Though I am a benefit auctioneer based in Virginia, I travel a lot. And I enjoy it! Six times in February and seven times in March I was on a plane or train headed off to work or visit clients. Most of that travel was along the East Coast, but this trip was out West …to California! Earlier this year I was in Los Angeles for a related business conference, but this is a new group. This trip is part of a 12-month Mastermind program focused on using new media (the Internet) in a business setting. I want to move my benefit auction business into a setting that enables you to be served with great information, regardless of where you live. Of the 100 people in this program, all but two are women. Most attendees are life coaches specializing in one field or another. Like most networking events I’ve attended, I am not only the only benefit auctioneer … I am the only auctioneer. The crowd is lively … the content is intense … the setting is beautiful (this photo with the boats was taken outside our hotel) … and I’m filled with creative energy. After today, I am excited! I can see enormous potential to teach charities around the country how to grow their events, even if I never have the chance to meet these new friends face-to-face. There’s lots of work to be done!